Since purchasing my first Overprint on Back error Web-Press note back in 2002, and shortly thereafter learning that the Web Press Series turned out being a 4 1/2 year failed experiment that ended some 6 years earlier, you may say I was bitten by the Web bug for both the Varieties and Errors. As luck would have it, during one of my Internet searches, I located a thread mentioning Bob Kvederas's Web Press Handbook, and after contacting him, was able to purchase a signed edition of "The Standard Handbook of $1 Web-Fed Test Notes - 1988A, 1993 1995" Second Edition June 2004. Having spent many hours with this book, indexing each Block and other items of interest, I would constantly be on the lookout for Overprint Errors and updating it. When I learned the math required to convert my Web Notes Serial Numbers into COPE Plate Positions, this had taken on a life of its own. By 2010, I was making C.O.P.E. Serial Number Charts for each confirmed Overprint Error, for both the Inverted Overprint and Overprint on Back Web-Press Errors to include in my copy of Kvederas's Handbook. As I now look back, I realize that this was the starting point for my Census. Unlike other Census's that only list Serial Numbers with no additional information (and anyone that read my Natick Census knows the problems I've encountered with Bart's Published Census, and the amount of work required to correct it), my Census is based on 16 subject (1/2 sheets) of COPE assigned Serial Numbers by Plate Position for each CONFIRMED error note reported, along with the additional Serial Numbers awaiting confirmation. With Serial Numbers in hand, this system has paid off handsomely with both the Web-Press and Natick Overprint Errors listed for sale without said designation... I was able to purchase 3 Natick Overprint Errors and 4 Web-Press Overprint Errors on eBay. Unlike my Natick Census ( https://www.spmc.org/blog/my-census-overprint-back-errors-natick-test-paper ), the amount of Confirmed Overprint Errors for Inverted Overprints is extremely low, and I have come to believe that the Treasury Department most likely removed and destroyed existing examples in their Possession from their inventory upon published reports. 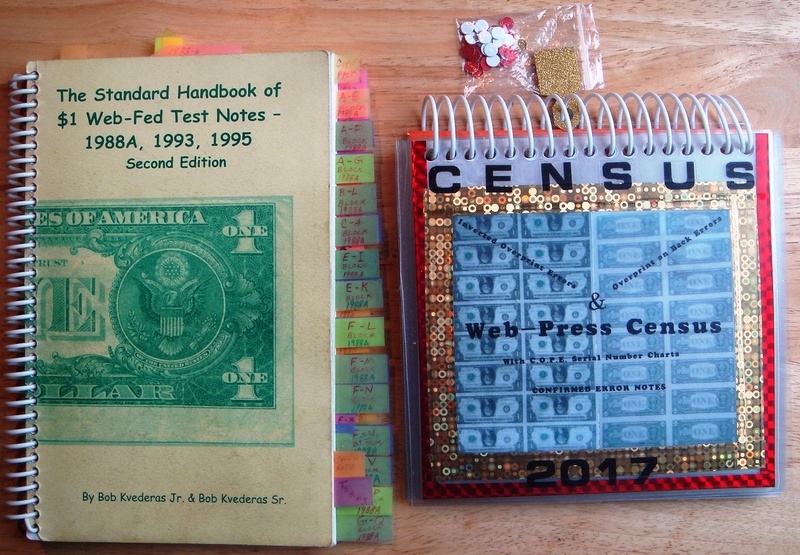 I have just completed my 2017 Census on Web-Press Overprint Errors, and to make it more interesting, I made it into a Book with the serial numbers on 16 Subject sheets and Numbered identical to the way COPE skip-numbers this Series. Block & Run information on each page is from the Web-Fed Test Notes Handbook and each page is laminated. In the Book I listed all 4 of my error notes "Chart Owners Note" along with self-stick "Red Dots" to include additional chart owners notes. Note: All the email messages sent to Bob Kvederas recently have gone unanswered. Since I was unable to get his permission to use information from his book for my Census prior to posting this, if Mr Kvederas request this be removed, I will take it down asap, Crop the pages to show ONLY the Serial Number Charts along with Block, Run & Sheet Data & repost for educational purposes only. *** Both Overprint on Back Web Errors reside in a PMG 3-Note Holder along with a Gem 66 Natick Test Paper Overprint on Back Error Note... Reason being that I believe these are the only 3 example types of $1. Overprint on Back errors since the One Dollar FRN's transition from Silver Certificates to Federal Reserve Notes (series 1963 to date) that can be classified as "Experimental", and would love to see other sets for comparison. With my recent issues with PMG the last 16 months, I will no longer use them and decided to holder my own 2 Web Inverted errors.